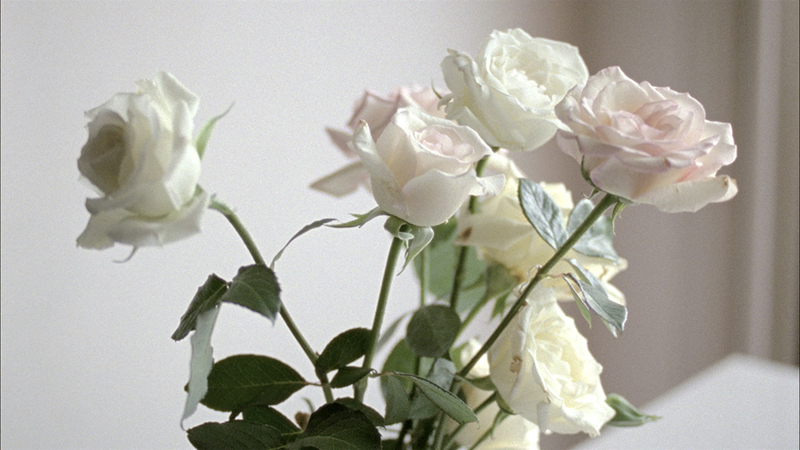 Alejandro Cesarco, Untitled (Remembered), 2014, archival inkjet print. Courtesy of the artist and Murray Guy, New York. Folding the memory over neat as a note you prefer to remain private. 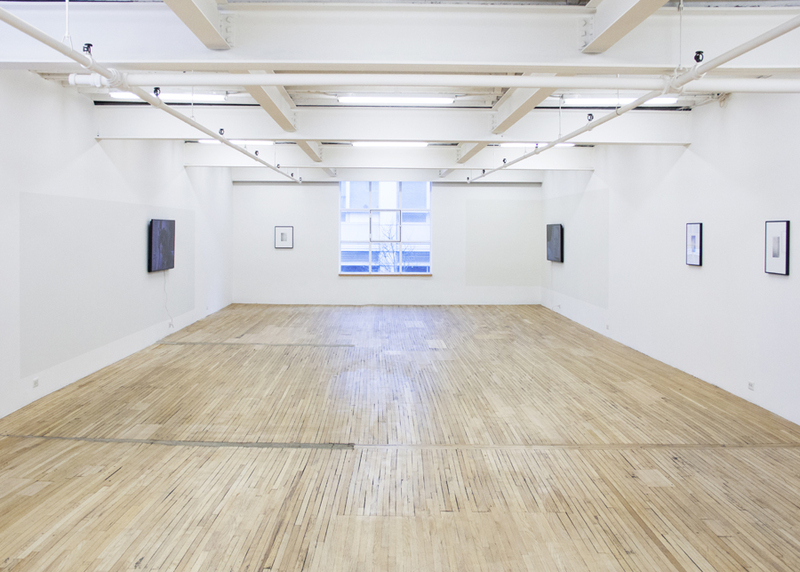 Alejandro Cesarco, Loyalties and Betrayals, 28 February – 4 April 2015, installation view. Courtesy the artist and Murray Guy. …these works are sparing in their revelations, guarded in their judgment; they yield to subtlety, are more uncertain, perhaps less attainable… Beautiful but mute, replete with repressed fears, desires, and resentments shimmering tenuously below the surface. Loyalties and Betrayals is understated. The installation, designed in collaboration with Martin Beck, makes use of gentle shifts in hue to delineate the two videos without sound. 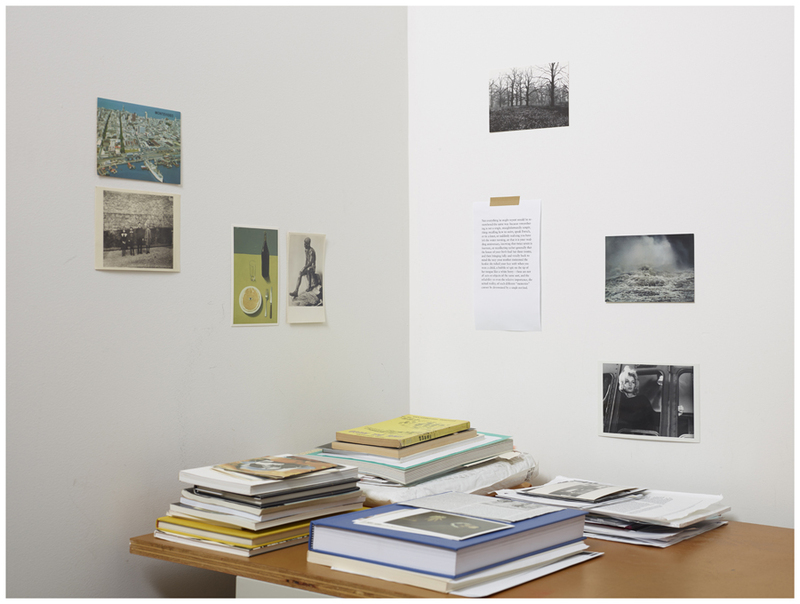 Additionally, three small prints are spaced unpredictably across two walls; a pair of photographs (shot from slightly different positions) of a wall (another surface) with text and another photograph of a portion of the artist’s desk, alluding to influences and pre-occupations, are positioned diagonally across on the other two walls. There is ample room to spare, yet the artist’s restraint is matched by a complex set of relations to language, absence, childhood, father figures, exile, memory, memories, and sorrow. Who comes of age unscathed? Who reaches mid-life without doing some harm? 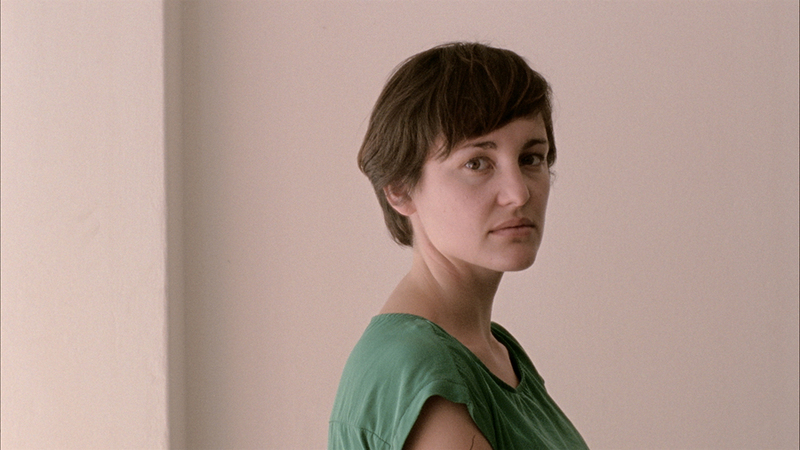 Alejandro Cesarco, Allegory, or, The Perils of the Present Tense, 2015, film still, 16mm film transferred to digital, color, silent, 9:30 minutes. Courtesy the artist and Murray Guy, New York. Loyalties, like love, are blind. Extended to ideals, individuals, or causes, they are considered true over time. There is no such thing as a short-term loyalty that wouldn’t be deemed as false. Loyalty in one direction often requires betrayal in another; it rarely stands alone. Used as a means to sidetrack conflict, it strengthens our resolve and narrows the decisions. While betrayals are directional, loyalties are hierarchical and prioritized, determined not only by personal, but also by familial, social, and political values. They can also be purely expedient (though there is rarely anything pure about them. One form of loyalty will trump another, generating betrayal in its wake. It is rare to act on loyalty without perpetrating betrayal as collateral damage; as such, loyalties – while considered noble – are never innocent, often changing lives irredeemably when acted upon. It takes space to fold time in feeling. Loyalties and Betrayals is Cesarco’s Palace at 4am – his theatre of memory – “a walking space of inscription and recall, of erasure and forgetting…and of reinscription,” as William Uricchio reminds us of the manner by which the art of recollection was practiced by the ancient Greeks and others for centuries until the introduction of printed text and the development of encyclopedic compendiums made their methods obsolete. 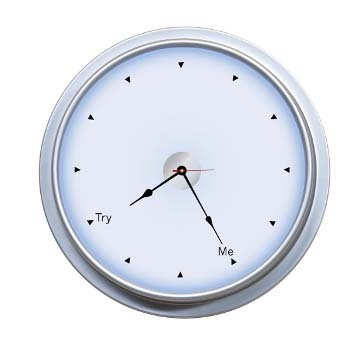 The mnemonic technique of associative recall (so reliant on the relation of memory to things) shifted in the 15th and 16th centuries to the prosthetic technique of the printed word; but for Cesarco, memory struggles between a desire to recall and a will to forget. There is no one way to remember. 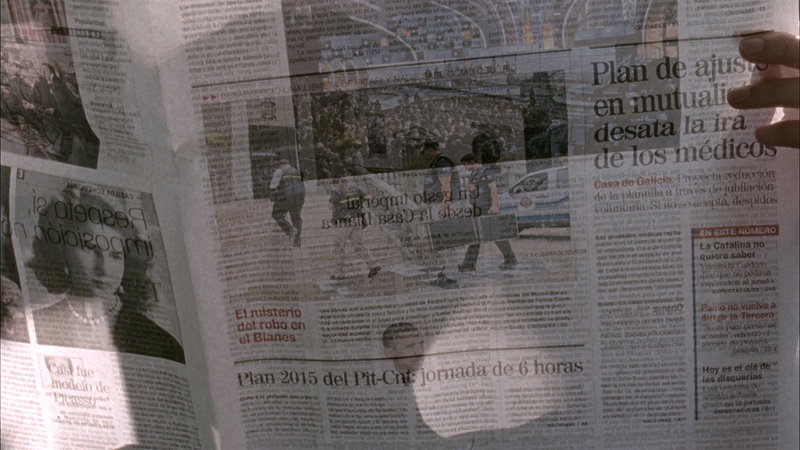 Alejandro Cesarco, Allegory, or, The Perils of the Present Tense, 2015, film still. Courtesy the artist and Murray Guy, New York. To take responsibility for a certain hedonism. Seeing something in real life that for a long time was just an image. Beauty as the promise of happiness. Alejandro Cesarco, Allegory, or, The Perils of the Present Tense, 2015. Courtesy the artist and Murray Guy, New York. In Cesarco’s gesture, real life becomes once again image…as reparation…an artist’s promise. Memory is time, of both spatial and visual logic, while narrative builds from a life determined by how he has played his influences true and how he has betrayed (or has been betrayed by) them falsely. For the difference between the artist as a young man and the artist approaching forty is the acceptance that the mature individual embodies both success and failure. In relation to influences – On Kawara, Roni Horn, Marguerite Duras, Ed Ruscha, and a photography teacher named Panta Astiazarán – we may feel ourselves to be either fraudulent or obsolete. Loyalties and betrayals – perception, direction, deception, and sensitivity – the impact of which is elusive within the mute beauty of these portraits, yet if I could perform memories as honestly and as succinctly, I think I could be happy. Edmund Burke, “Review of Tristram Shandy (1760)” in Lawrence Sterne, Tristam Shandy, ed. Howard Anderson (London: W.W. Norton & Co., 1980), 481. [quoted in Pablo Lafuente, “In Praise of Populist Cinema. On Hito Steyerl’s November and Lovely Andrea” in Nick Aikens, ed. Too Much World: The Films of Hito Steyerl (Berlin: Sternberg Press, 2014), 88. All stand-alone phrases in italics are quotations from Alejandro Cesarco’s Allegory, or, The Perils of the Present Tense (2015), 16mm film transferred to digital, color, silent, 9:30 minutes, ©Alejandro Cesarco. I am referring to Alberto Giacometti’s The Palace at 4am (1932), collection of the Museum of Modern Art. See William Uricchio’s “A Palimpsest of Place and Past” in Performance Research 17:3 (2012), 45-59. ← The brilliance of Snow(den) – Congratulations Laura Poitras!